He used to be a hairdresser you know... not that you can tell. He didn't quite get to the cutting part so is only really skilled when it comes to sweeping up hair off the floor, washing hair and putting in a blue rinse (oh, and fetching me a cuppa and a biscuit when I call for one). But I am sure he tormented a few little kiddies in his early hairdressing apprenticeship days... and if he did, today was payback day! I . . . will . . . refrain. So adorable. 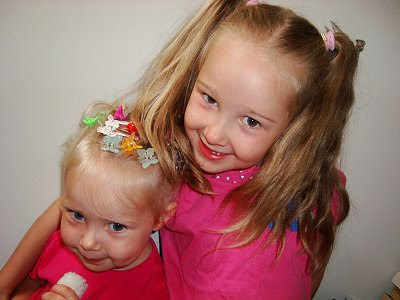 I remember the days where Dad watched Telly and I would climb up on the back of the chair and comb and clip and tie Dads hair. Childhood memories! Your girls are just so cute! Si is such a good patient daddy! That is too wonderful for words. what a daddy! Excellent! Wait till they play make-up shops! Now that's fun! Ha! Ha! Ha! I hope you can tell that I am having a belly laughing fit!!! Thanks I needed that! HEHE! 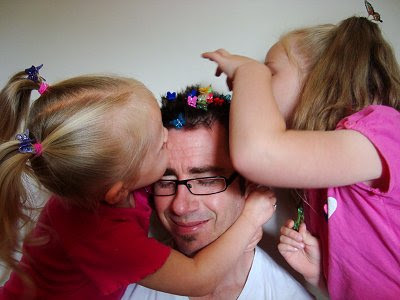 My girls wouldn't be able to do that to their dad - he shaves his head!! Ahhh a man of many talents! What a great look! I loved this post! I even had some dramatic music like Jaws playing in my head to go with it! I have prepared something for you on my blog. Enjoy! It's a good look for him! 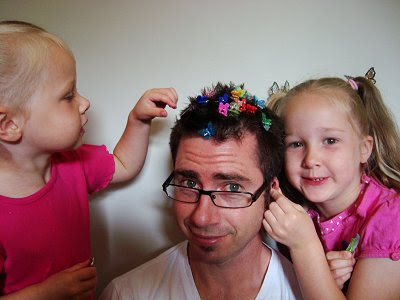 I dare him to let the girls do his hair one morning before he preaches. DARE!!!! !